Denise Vasqez, creator/producer and host of six consecutive successful LADIES NIGHT MUSIC FESTIVALS in the USVI, was bringing together the BEST FEMALE PERFORMERS for a cause…this time in LA! Singer/Songwriter Denise Vasquez was the instrumental force in putting this event together, called "Women for a Cause". It was designed to benefit women with cancer and the proceeds were going to The Red Cross, Green Peace, and the Ovarian Cancer National Alliance. She’s put events on before as mentioned above, so this was well-run, entertaining and the performers across the board were well chosen. Mostly acoustic singer/songwriters with small back up bands and a few comediennes. First of all, her choice of venue couldn’t have been better. Not a regular club but a large Mexican restaurant "The El Guapo Cantina", right on the Melrose Strip in Hollywood with a spacious courtyard. Huge Umbrellas shaded the patrons from the heat and the whole atmosphere was fun and sunny. There is NOTHING like live music..outdoors.. especially in a comfy setting like this. The far alcove became a makeshift stage with a small P.A. just enough to fill the space. The ever so helpful Charlene White ran the sound most of the time and managed to keep it pretty much under control. Except for a short time when massive feedback interrupted one of the performers, it went rather smoothly. I would suggest for future small events to NOT put the speakers BEHIND the microphones, but move them upfront. It’s easier to control feedback plus the audience hears the vocals better. The event started at 2 PM on a Saturday afternoon and lasted well into the night. We got there around 5pm so we didn’t see the opening rounds of performers. Our first duty as always, was to order food and drinks.. reviewing is strenuous and one has to be in top form (grin). Mexican beer and a plate of Fajitas did the job.. we were ready! Upon arrival MARA (marasong.com) was already well into her set but the remaining 2 songs this reviewer caught were super! She’s a powerhouse singer with an aggressive guitar style and body language. By herself this time, belting out the tunes and making everyone attending feel good. 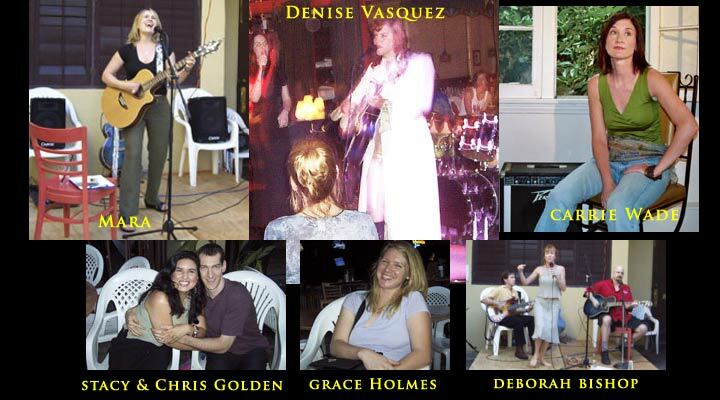 Denise V. was a most gracious hostess, interacting with performers and audience, being her charming and beautiful self. She’s gone thru a medical condition recently and part of her motivation for putting this event on was to thank the Red Cross and people who donate blood, because as she put it: "it had saved my life recently"! STACY GOLDEN took the stage with her guitarist Shin Kawasaki and husband/bass player extraordinaire Chris Golden. They played a few sultry and sweltering songs off the new CD "Thin Wire Walk", accentuated by Stacy’s wonderful and warm voice plus Chris’ fab bass playing. There isn’t a bass player better who knows how to transform a song from nice to great as this guy can. They posed for a cute pix together (as seen here). I’ve seen Stacy and Chris perform together as a duo, just voice and bass… and lemma tell ya.. you wouldn’t miss a guitar in that set up. Shin K. however does a nice job playing guitar with them and fills it out well. DEBORAH BISHOP followed with a set of her country/jazzy soulful songs. She’s got a great voice.. high and clear.. and she’s doing the country thang really well. The songwriting is excellent. Catchy, infectious…the kind of songs you swear you’ve heard on the radio before.. but you probably haven’t… she’s got that formula down. Backed up by guitarist/singer George Leger III who also co-writes with Deborah and Ken Moore on bass, this little combo did a nice job under the blue skies. And thanks Deb for the nice compliments towards Female Guitarist The Shredmistress from the stage. You have good taste girl. Deborah Bishop is relocating to Nashville soon so it was good to hear her once again. Best of luck to her in Nashville. I had never met or heard about ANGELA UEBER. She did a couple of acoustic numbers and what struck me right away was her unique voice. More rock-style than the average acoustic singer. The guitar playing was very nice and from what someone told me she’s a competent electric guitar player in her band as well. Great stage presence.. tall… assertive.. pretty.. she took command of her set and the audience. Carrie Wade took the stage after that. This is another singer this reviewer had never met but evidently she and Denise go way back, having been together in the L.A. music scene for a while. She started off just fine at first.. in fact.. the 2 opening numbers were great. She’s got a sweet and mesmerizing sound to her voice, her guitar playing was cool and her messages profound. She transformed the place for a moment into a contemplative and magic environment. Then she decided to sit down, re-adjusted the mike and that prompted the little P.A. to go into a tail spin. Feedback..squeals… frantically Denise and female guitar shredder ‘The Shredmistress’ were coming to the rescue but couldn’t quite make it work out. Charlene White had left for a break so we were trying to get Carrie’s voice and guitar working and she struggled thru a few numbers with intermittent feedback. I could tell it had taken the wind out of her sails. Like the trooper she is though, she went with it and in the end was able to convey her message. By now it was getting dark and the place was filling up. Throughout the day it was a constant coming and going of people. Some stopped by for a little while, others stayed for hours. But now it was hopping. PE an African American singer from New York and her guy guitarist were tearing it up. A mix of funk and rap she was great. Got the crowd moving with a dynamite set of lively songs. Nice vocal range and projection. Her vocals got lost just a bit because she exercised what’s known as "mike control" meaning stepping away from the mike when belting. However.. in this sort of set up that’s usually not the best thing. You gotta EAT THE MIKE girl… nevertheless, we were all attentive during her set and her talent came thru big time. I had time for one more performer and that HAD to be..drumroll please… DENISE VASQUEZ. She said she was "exhausted" and I bet she was. This was a massive undertaking plus she was hosting, chatting and attending to the whole thing. She didn’t look it though. She ripped right thru a few numbers with her small back up combo and took no prisoners. I’ve reviewed her before and I don’t wanna repeat myself like a broken record but… she’s got the works. Songs, voice, looks, great attitude on stage.. you just GOTTA like her. People were totally into it. She’s well liked in the music community and I see why. Her voice soared into the now darkened sky, her body moved to the music, she smiled and made everyone feel welcome. Great great job and kudos to Denise for putting out such effort on all fronts! KELDA, LORA CAIN, MARINA V, DAWN GRABOWSKI, CHARLIE WHITE, ANZU, DEBBIE HENNESSY, AMANDA TURNER MANNING, COLLEEN GRACE, TACKY JACKY. I know I missed a bunch of great stuff but it was a 10 hour event and from what I hear is that there wasn’t a weak link in the chain. I believe it because I’ve heard some of the remaining artists before. I had a blast… it was great meeting lots of friends there, Judy Sandra and of course the adorable Grace Holmes and her mom Nancy. We chatted it up. Nice pix of Grace is included here, as she was having a great time and it shows! Carry on Denise and I’m looking forward to the next bash, which, I’m sure, is in the works.